I added the first set of chains but haven’t decided what to do next. The chain for the back isn’t going to work the way I planned, but I’m not sure what to do there instead. Also, I haven’t added the edging in the front but I’m not sure if I will as if might be too costumey. It doesn’t work well worn unlinked, but what’s cool is that the chains can link up in a bunch of configurations. I wore this out to the grocery store. The weight of the coat is more early spring/late fall than winter, so I’m hoping I’ll be able to get some decent wear out of it this season. Side note: I love these shoes! I bought them maybe a decade ago from a long gone shop in the underground walkway between the Toronto bus station and Eaton’s Centre. If I remember correctly, they cost $8. 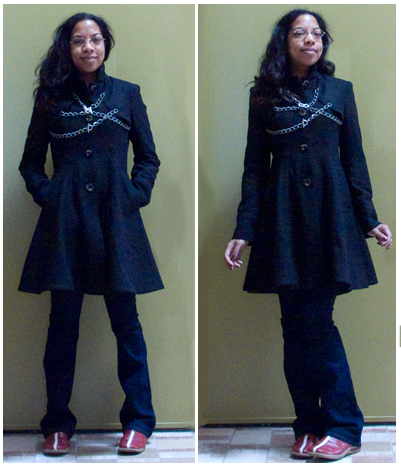 For a few years now I’ve been wanting to add some chain toggle closures across the chest of a black coat. I have a black winter coat but it doesn’t have the detailing that I had been envisioning – also, I didn’t want to ruin the damn thing. I stumbled upon a black coat with these sort of shoulder/chest flap things, which give it a bit of a military vibe, but the fit and flare silhouette is pretty girly. A nice combo, so I grabbed it. The coat is from ASOS and is the ASOS brand, which can be pretty cheap. This actually works for me: it’s almost felt-weight, so I’ll be able to wear it in the spring, and it’s cheap enough that if the additions look bad or damage the coat, I won’t beat myself up over it. 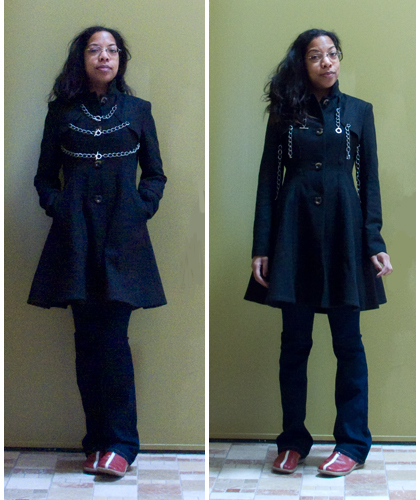 The left is the coat now: black, brown buttons. The right is what I’m going to add: 3 thin silver chains with toggle closures across the front flap thingies, 1 more in the back where there’s currently a pair of buttons, a long chain loop from the front to the back (where there’s currently another button), and bracelet type chains from the sleeves. Oh, and replacing the round brown buttons with long metal ones. And, depending on how it looks at this point, possibly adding a chain edging across the shoulder flaps. This should be pretty easy to do. 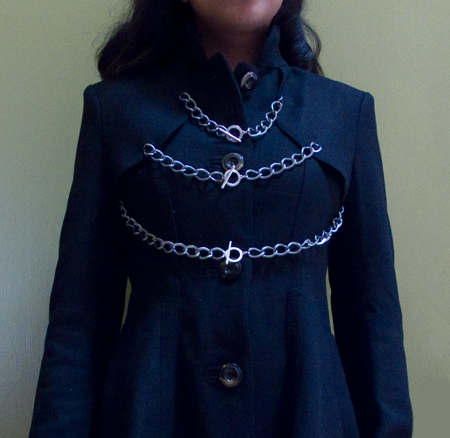 I have the chains, the toggles are in transit, I need to find some buttons, and then I’m good to go.